PODD. 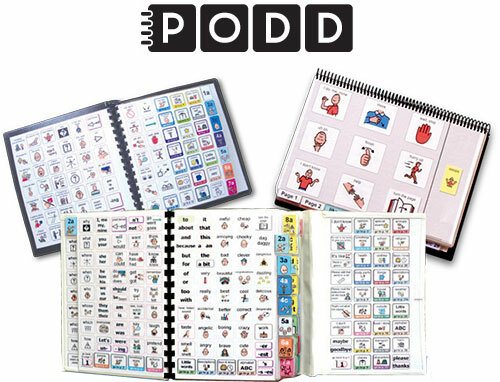 PODD or Pragmatic Organization Dynamic Display is a both a method of communication/method of teaching communication and a set of manual communication books. PODD was created by Gayle Porter in Australia. PODD materials are arranged especially to be used for social interactions (pragmatically). Messages in the PODD flow from one page to the next by way of page numbers that guide the user through a conversation. So a conversation can move easily through conversational turns. Wow! First of all if you ever get the chance to attend a workshop Linda Burkhart presents you should go. Second of all it is seeing videos of PODD in action that really "sells" it for use with our students. The first thing I did when I came home from the conference was apologize to our SLP. The second thing was to lay out a plan to introduce PODD into my classroom. PODD really is everything that people who use it rave about, but it can be hard to tell that from reading descriptions and looking at pictures. If you really want to see what PODD is about you should start by going to YouTube or a similar video site and watch videos of PODD in action. PODDs are intended to be as much for receptive communication as they are for expressive communication. Communication partners of individuals using a PODD also use the PODD to communicate. Modeling or Aided Language Stimulation happens constantly as both communication partners use the PODD. For the first it pretty much only adults used the book. Eventually our student started to internalize the way PODD worked and communicate with us using it. The only way to purchase PODD right now, in the USA, is from Mayer-Johnson as a Boardmaker Add-on. It costs $325 (in addition to the cost of Boardmaker if you don't already have it). You will have to customize, print and bind the PODD books yourself. The PODD boards that are available for purchase are designed for direct selection. It is possible to customize these yourself for visual, auditory or multi-sensory scanning or other means of access. Gayle Porter, Linda Burkhart and others are working on creating alternative access PODD materials to sell. PODD can also be a great bridge to high tech dynamic display communication. In our school we have modified it on a Tobii C-eye for a student who communicates through eye gaze and on Proloquo2Go on an iPad for use with direct selection. (I am waiting with baited breath for Proloquo2Go to add two switch scanning so the student described above can user his iPad to talk!) Currently using PODD on a high tech device means doing all the programming yourself, but it is worth it. I have chatted with a few high tech AAC vendors about PODD being available as a vocabulary set, but currently none of the vendors has plans to do so (at least that they were willing to share with the likes of me!). You can read more about PODD from Linda Burkhart's website and handouts. She also has a great hand out about using PODD with Partner Assisted Scanning, the hand out is meant for working with those who have Rett Syndrome, but applies to most, if not all, situations in which you would use partner assisted scanning. Novita also has a great website about PODD. Don’t become overwhelmed by the size and organisation of the book, stress about where to find a specific vocabulary item, or worry that the child will not be capable of navigating through all the levels. The child doesn’t have to navigate the levels. The partner can make the level changes for them. DO NOT TURN PAGES ONE AT A TIME LOOKING FOR VOCABULARY. If the child sees others do this that is what they will do. Go back to page 1 at the end of each message. Re-auditorise or ‘re-cap’ the message when your partner is selecting symbols or when you are moving between multiple levels in order to keep the message ‘current’." The only way to purchase PODD right now, in the USA, is from Mayer-Johnson is as a Boardmaker Add-on. It costs $325 (in addition to the cost of Boardmaker if you don't already have it). My favorite experiences in life have happened at summer camps. As a child I went to Girl Scout Camp, drama camp and lots and lots of sports camps. As a teen I worked at a variety of special needs camps and attended student leadership camp. I spent every summer of my life age 5-33 at some kind of camp for at least some of time, be it attending or working. I love everything about camp, the friendships, the swimming, the camp fires, the singing - everything! Most of our students attend some kind of summer school program to prevent regression and address emerging skills, but some are lucky enough to also go to summer camp. AAC summer camps are for children (and sometimes adults) that use a speech generating devices. Often times AAC camps are "family camps" with workshops for parents and activities for AAC users and siblings. AAC camps can be a great way for AAC users to do a traditional summer activity and meet others who use AAC. look at the specialized schools in your area, do any of them do a great job at AAC? Why not ask if your child can attend just for the summer? Perhaps your school district will allow this instead of their in house summer school? start your own AAC Camp or even an AAC social group! 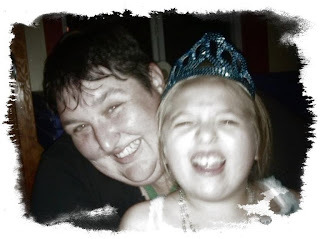 *this list deliberately only includes AAC only camps, not camps for children or adults with disabilities who may or may not use AAC, it also does not include AAC camps which do not appear to be running in 2011 or which do not have websites. Did I miss your camp? Please comment to add it! On occasion a family will ask for information about wish granting for their child. A few things to know include that children's wish agencies generally, but not always, ask that the child be ages 3-18 (sometimes 21), have a life limiting condition (as documented by an MD), have no prior wishes granted and be able to communicate their own desire. There are wish granting agencies in nearly every country from Canada to Pakistan to Singapore. Every state in the USA has one or more chapters or self-contained wish granting agencies. Some wish granting agencies are for specific age groups, conditions or even have to be recommended by a specific person. Let families know they can search the web, talk to their doctor, social worker or other medical professional for more information. Believe in Tomorrow has three adventure programs for bullriding, flying and racing as well as respite and hospital housing. 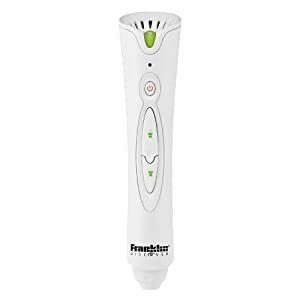 The Franklin AnyBook Reader is designed to make any book and interactive, "read to me" book. Essentially you attach special stickers to the pages of books and then when you touch the pen to the sticker it plays back a self-recorded message. The Franklin AnyBook Reader come in a 15 or 60 hour edition, costing about forty to fifty five dollars. It uses double AA batteries to run and comes with 400 reusable, removable stickers. You can even check out the AnyBook Reader Blog. Below is a slide show of single button communicators. It contains single message, sequential message, random order message and auditory scanning communicators. The communicators vary in size, length of message(s), durability, speech quality and other features. This visual glossary may be helpful in knowing some of the options that exist for this style of voice output communication aid.